Most of us know that Tunisia is an Islamic country located in Africa - but perhaps not more than that. I too did not have a detailed knowledge of Tunisia either till a few days back. It was just by chance that I came across a very wide collection of photos of Dennis Jarvis from Halifax Canada on Flickr, where I also share my photos as jalalspages, who has widely traveled around the world, including Tunisia. And when I started to explore his photo-stream of Tunisia, I was flabbergasted to see the archaeological richness of this African country which dates back to 10th century BC. And then as I kept moving forward into his photo-stream, I virtually traveled form northeast of Tunisia along the Mediterranean Sea and then continued traveling to its eastern border and saw the beautifully photographed archaeological trove of Tunisia by Jarvis. 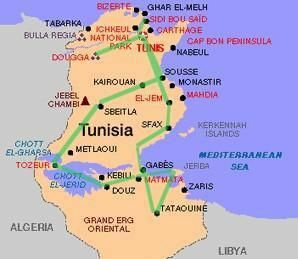 I may add here that Tunisia, which derives its name from Tunis - which is the capital of modern day Tunisia today, is the smallest country in North Africa, spread over an area of 165,000 square kilometres with an estimated population of 10.7 million. It is a Maghreb country bordered by Algeria to the west, Libya to the southeast and the Mediterranean Sea to the north and east. The south of the country is composed of the Sahara desert, with much of the remainder consisting of particularly fertile soil and 1,300 kilometres (810 mi) of coastline. Arabic is the official language, and Tunisian Arabic, known as Derja, is the local, vernacular variety of Arabic and is used by the public. Due to the former French occupation, French is widely used in education, the press, and in business.